Drafted with pick 33 in the 1999 National Draft, Clarke is the brother of Geelong’s David Clarke and Olympic runner Georgie Clarke. 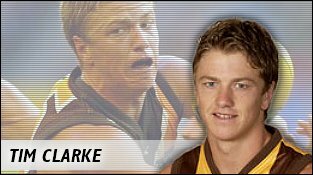 After sitting out season 2000 to concentrate on finishing school, Clarke made his debut at the start of season 2001. Impressing early with his hard running and gutsy efforts at the ball despite his small frame, Clarke played 15 senior games in 2001 until breaking his collarbone in an off-the-ball incident against Fremantle in round eighteen. Unfortunately for Clarke, he failed to recapture his 2001 form in 2002, with a poor season that saw his future in the balance come season's end. Out of contract and with Hawthorn only offering a one year deal, Clarke was courted by Fremantle but decided to stay put at Glenferrie. Responding to the disappointment in pleasing fashion, Clarke worked hard on his skills and body, and whilst still resembling a jockey, he has graduated to a hurdle-jockey's weight. Tried as a negating midfielder, he enjoyed success on small, nippy opponents whom Clarke frustrated with his ability to run with them all game long. Clarke continued to work hard in 2004. After a disasterous game against the Bulldogs where he kicked the ball deep into the MCG construction zone his career appeared over, but he battled hard and ended up 5th in the best and fairest, mainly thanks to his work ethic and psychotic attack on the footy.